My First Trip to Europe: Competing in the European Union Jr. Cup! this year I was able to compete internationally for my first time! I went with My slalom team, Team Colorado Whitewater Racing Club, our coach Jordi, and my parents to compete in the European Jr. Slalom Cup which featured an under 14 category. We landed in Milan, Italy, where Jordi and another coach (Cristian from Spain) picked us up and drove us straight to Solkan, Slovenia. After settling into our amazing hotel one block from the course, Hotel Solkan, we immediately started to train. It was a super fun course and the water was a gorgeous, light, aquamarine blue which made the paddling that much more exciting. After a few days of training, we were ready for race day. The course had a lot of offsets and looked really fun and there were about 25 under 14 jr. women registered to race! My first runs were pretty good and I made it into finals in K1 and C1. My second runs were even better and I finished 3rd in C1 and 5th in K1. A new course was set for the next day and then it was off to bed. The next morning, I was super excited to race and my runs were even better than the day before. I made it to finals in K1 and C1 again. I ended up 5th in K1 and 3rd in C1! The water color was awesome! We left Solkan and drove to Augsburg, Germany for the next comp. It was the first time I had been on an artificial course since I was 9 (The Olympic Training Center in North Carolina and ASCI in Maryland) and I loved it! The facility was incredible, with 3 different channels and several different buildings which housed hundreds of boats belonging to the local race clubs. There were even more athletes competing in this race so the courses were very crowded. After some 4 a.m. morning training sessions (we had it all to ourselves!) we were familiar with the course and I was stoked for the race! 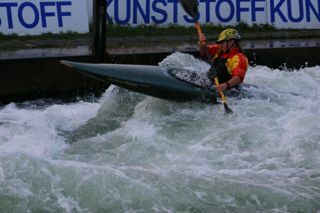 I made it to finals again on both days in K1 and C1 and I was 5th in K1 and 4th in C1 overall. In the morning, we did one more session in Augsburg before driving Ceske Budijoce in the Czech Republic, probably my new favorite course! It had a lot of holes and you could use their curlers to go from one side of the river to the other, it was a blast. Unfortunately, we only had two 45 minute training sessions before the race! The course was tricky, but we had practiced most of the moves and I was super stoked for the race! My runs were pretty good on the first day and I was 3rd in C1 and 4th in K1, but the next morning, I became really sick and was unable to race in the last of the European Jr. Cup Race that we were attending. Luckily, I had a quick recovery and was able to race the next day in The Wave competition, a local, open race (no age separations) and I had an incredible K1 run and ended up 16th out of about 50 women making the cut for finals, and in C1 I was 9th, missing the cut by a few seconds and 1 place. My finals run was not my best, but I ended up 12th overall, barley missing making the top 10 to go to finals. I was still super happy with my runs and was sad to leave, but it's been nice being back in the US. 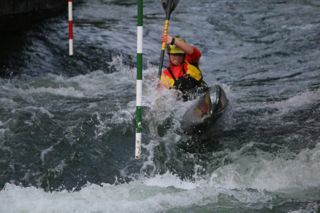 Now i'm training for freestyle nationals and Jr. Slalom Team Trials! I finally old enough to make the team!! !